During her first weeks at Mary Washington in the fall of 1964, a young Merrilyn Sawyer was noticeably shy. Then one day, her roommate offered some valuable advice. "Speak up," Marjorie Arnsdorff told Merrilyn. "If you don't speak up for yourself, no one else will." Looking back, Merrilyn Sawyer Dodson '68 says that advice hit home and ultimately changed her life. "I did learn to speak up for myself," she says. "I worked campus jobs all four years at Mary Washington, I studied hard, and I participated in everything I could — from art exhibits to concerts to student government. I wanted to make use of everything Mary Washington had to offer." After graduation, Merrilyn taught math in middle schools, high schools, and colleges. She received a master's degree from Old Dominion University and continued her career as an instructor for adults, and then as an instructional designer for three government contractors. While she was immersed in math and education, her husband, Steve, was a Master Shipbuilder with Newport News Shipbuilding. Now retired, they reside in the Tidewater area of Virginia and maintain close contact with Mary Washington. Proof of their dedication is on public display in their driveway and on many highways and byways around Virginia. "I ordered my custom 'TRY MWC' license plates when I served on the Alumni Board as vice president for recruitment," says Merrilyn. "They worked back in the '80s, and they still work today. Wherever I go, people ask me about Mary Washington, and I am proud to tell them all about it." Steve is equally proud to champion Mary Washington. "When I first started dating Merrilyn in the '60s, the only boys around were visitors like me. After more than four decades of evolution, I still love everything about the University. I love the beautiful campus and the people that I have met through the years, including members of the Class of 1968, students, faculty, and staff," he says. "Most of all, I love what Mary Washington has done in helping to mold my wife into the outstanding individual she is today." 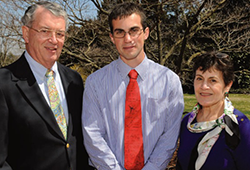 In April 2013, the Dodsons attended the Donor Appreciation Luncheon to meet Benjamin Tuxbury '14, the second recipient of the Merrilyn Sawyer Dodson/Class of '68 Scholarship. "He is a double major in mathematics and computer information systems, he is on the Eagles' track team, and he still found time to be inducted into the national mathematics Honor Society," says Steve. "Our recipient is the epitome of what the University of Mary Washington represents." In addition to being proud benefactors of a scholarship, the Dodsons also joined the Heritage Society when they named the University as a beneficiary of a revocable trust. "My educational experience at Mary Washington literally changed my life, and it is part of who I am today," says Merrilyn. "It's only natural that we include the University in our estate plans."